The Midland Railway route linking Derby and Manchester across the Derbyshire Peak District must rate as one of the most spectacular lines ever to have existed in the country. Whatever the merits and claims of other lines, the railway, which carved through Derbyshire’s great limestone hills, has been described as the most scenic line in Britain. Because of the terrain, numerous tunnels and other impressive civil engineering features including the magnificent viaducts at Millers Dale and Monsal Dale had to be constructed. The railway was not conceived as a single entity by one company but was in fact the result of the ambitions of several separate companies who for their own individual reasons, built the line at different times over a period of some 20 years. Nevertheless, the eventual result of these ventures was a mainline providing a direct route between Derby and Manchester. The first section of the route between Derby and Ambergate was opened to traffic on 11th May 1840 as part of the “North Midland Railway” line to Rotherham via Chesterfield. Northwestwards from Ambergate to Rowsley was constructed by a company with the lengthy title of the “Manchester, Buxton, Matlock and Midland Junction Railway” (M.B.M. & M.J.R.). 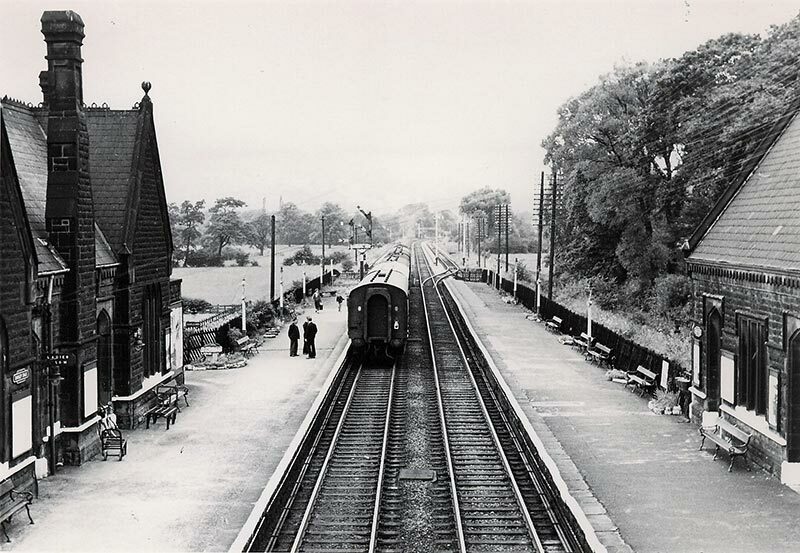 June 4th, 1849 was the official opening day of the Ambergate-Rowsley section, with passenger and coal traffic commencing running on 20th August. 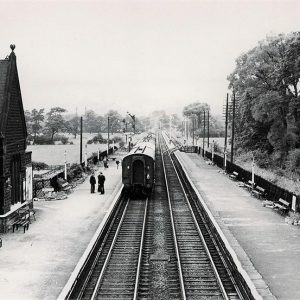 The original scheme was to build a line from Cheadle to Ambergate with the Manchester and Birmingham Railway and the Midland Railway providing financial support as both companies expected to gain from this link. However, the L.N.W.R. having been formed by an amalgamation of various railway companies, found it had a shareholding in the M.B.M. & M.J.R., a line that it was not interested in as it would be a source of competition. Eventually in 1871 the M.B.M. & M.J.R. was absorbed into the Midland Railway system. 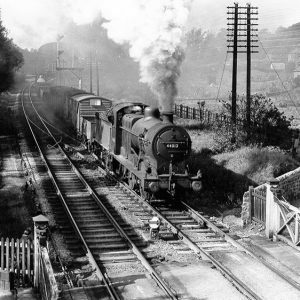 Before this date the Midland had already constructed a line from Rowsley to Manchester, although this did not follow the route intended by the M.B.M. & M.J.R. owing to the opposition of the Duke of Devonshire to the idea of a railway through Chatsworth Park. In its efforts to gain a through route to Manchester, the Midland Railway had surveyed several possible routes to achieve this end. 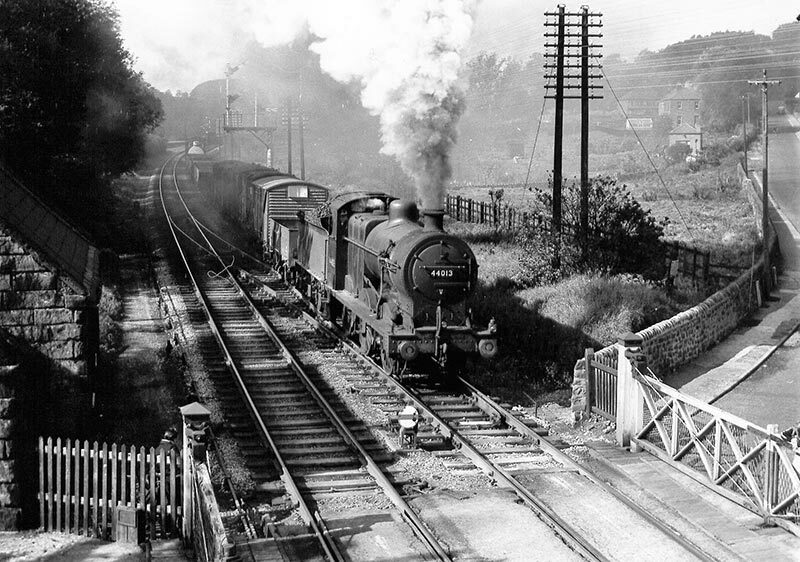 A line from Duffield to Rowsley was commenced but was terminated at Wirksworth. One outrageous proposal, however, was the upgrading of the Cromford and High Peak Railway to main line status which would have resulted in Derby-Manchester expresses going over gradients as steep as 1:8. The section of the Rowsley-Manchester line was commenced in September 1860. Heading north from the new Rowsley station was Haddon Hall, ancestral home of the Duke of Rutland. The Duke was unwilling to allow the railway to cross his estate on the surface, so the company was forced to go underground. Haddon Tunnel at 1058 yards is the longest between Matlock and Buxton; it is in fact a covered way being on average only 12 feet deep. A cutting would have sufficed to preserve the view from Haddon Hall, but the Duke did not want to see smoke and steam rising above his stately gardens. 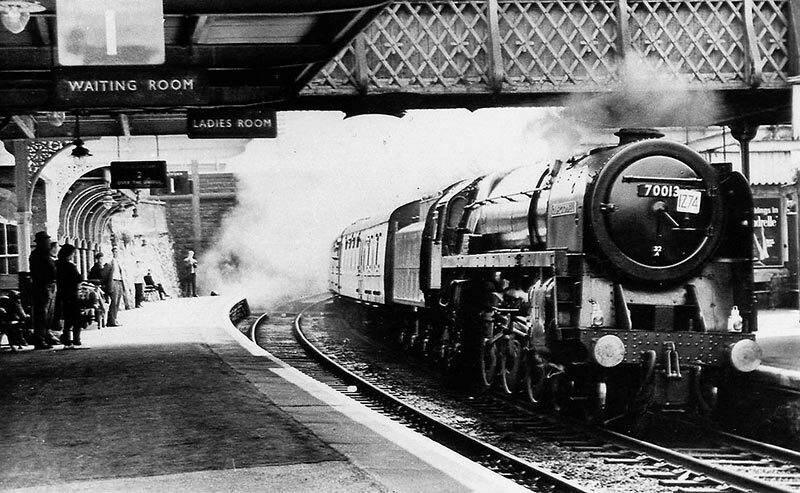 The Duke used Bakewell station for boarding and alighting from trains and it was therefore a far grander affair than one would expect of a small market town. His coat-of-arms was built into stonework on the platform façade. The Duke of Devonshire used Hassop station which was 2 miles from the village from which it took its name. The next station along the line towards Buxton was Longstone, later named Great Longstone, which served the occupants of nearby Thornbridge Hall. Heading farther northwards, the railway passes through the 533 yards Headstone Tunnel, and from this the line bursts spectacularly on to Monsal Dale viaduct. The structure has five spans each of 50 feet. Although resented by a few prominent people when built, it now blends perfectly well with the surrounding countryside. The station at Monsal was provided for tourists, as there are very few dwellings in the area. The down platform was cut of the stone hillside while the up platform was built on wooden piles, as the valley is so sheer at this point. Cressbrook and Litton tunnels at 471 yards and 515 yards respectively follow in quick succession. Climbing at 1 in 105, the line reached a summit east of Millers Dale before falling into the station here. Before Millers Dale station is entered, two viaducts stand. The southern-most was built when the line was opened while the northernmost was opened in 1905. Millers Dale was originally two platforms plus a bay for the Buxton branch. When the second viaduct was completed, two platforms were added making a total of five. This might seem, again, to be a very large station for what was only a small hamlet with few inhabitants, but this was because people wishing to travel to the Spa town of Buxton had to change trains at this point. Such was the practice of the Romans for building settlements on the tops of hills, that there was no other means of providing rail communications other than a branch to this important Spa town. However, in recompense the Midland provided a fine station building, which possessed a handsome façade and this, was copied by the L.N.W.R. terminus next door. From Millers Dale innumerable problems were encountered with the next section towards the junction at Peak Forest. With the River Wye occupying the valley floor, three tunnels were constructed, Chee Tor No. 1, Chee Tor No. 2 and Rusher Cutting. Such was the shortage of space at this point; the track bed was hewn into a shelf in the valley side. Moving northwards, the branch to Buxton deviates from the main line to Manchester at Millers Dale Junction. Here the smallest station in Britain was sited at Blackwell Mill Halt. This was built to provide transport for the nearby railway cottages. Only a few trains a week stopped here to enable the wives to collect their shopping from Buxton. From Peak Forest, this line enters Wye Dale and the 191 yards Pic Tor Tunnel and into Ashwood Dale. A further tunnel here exactly 100 yards long brings the line on to Ashwood Dale viaduct and into Buxton Midland Station. 1st January 1923 marked the first major change in the administration of the railways in the Peak District. From that day the railways of England were grouped into four companies. As far as the Peak District was concerned, the lion’s share went to the L.M.S. From a local point of view nothing much changed. Red carriages with gold lettering still formed the Midland expresses. On some occasions, an L.N.W.R. locomotive hauling Midland coaches could be seen, a sight unheard of before 1923 and one that would have virtually caused civil war. The amalgamation meant that competing routes could be rationalised. 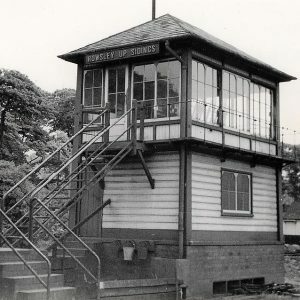 The two Buxton stations were placed under one stationmaster; the former L.N.W.R. platforms were numbered 1. 2. and 3. And the Midland ones relegated to 4. 5 and 6. Departures for Manchester could be arranged alternately instead of simultaneously, but the longer journey time via Millers Dale resulted in alternate departures from Buxton becoming simultaneous arrivals in Manchester. 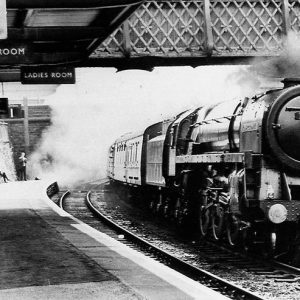 Throughout its long career, the Peak Line was used by many fast expresses including the “Peak Express”, the “Palatine” and the “Midland Pullman”, providing evidence of the significance of this railway. Impressive locomotives were frequently observed traversing its metals including Samuel Johnson’s superb 4-2-2 express engines, while in later years, Jubilees, Patriots and the occasional Royal Scot handled the heaviest passenger traffic over this steeply graded line. Before the eventual demise of the route, Britannia’s and the Blue Midland Pullman gave glory to the twilight years. Freight traffic was also of great importance throughout its history. Following the demise of the Lancashire coalfields during the inter-war years, much of the coal to power the industry of the north-west had to be transferred across the Peak District from the East Midlands. The increased volume of freight resulted in large numbers of Stanier 2-8-0’s, the large Beyer-Garratts and in later years 9F’s could be seen blasting their way up the inclines with their seemingly endless coal trains. 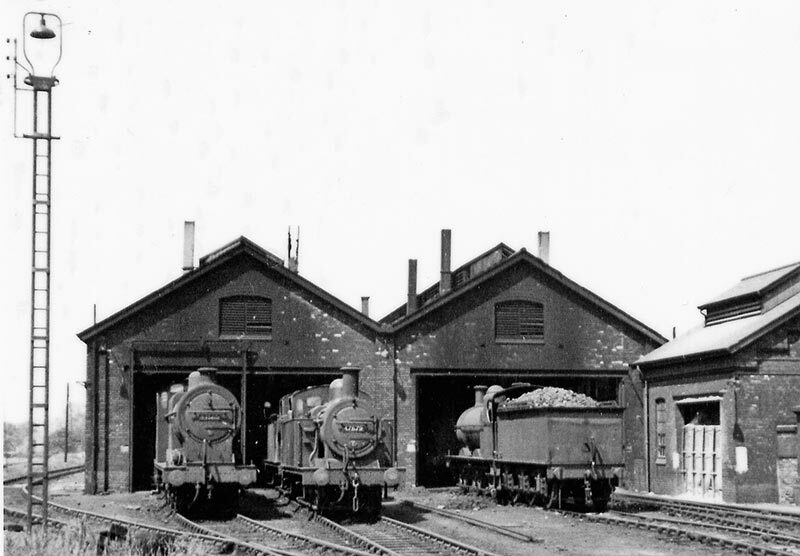 Because of the severe gradients encountered on this line, particularly from Rowsley northwards, banking engines were often required, supplied from Rowsley engine shed, to ensure a clear flow of traffic over the main line. Except for a few short downward stretches, the line from Rowsley climbs at an average of 1 in 100 over its entire length, making life for the engine crews particularly difficult, especially in wintertime when the weather can be extremely severe. From Rowsley the line climbs almost 600 feet on its journey to Buxton. In 1962 came the publication of “The Reshaping of Britain’s Railways”, more commonly called the “Beeching Report”. The recommendations of this weighty volume included the closure of two-thirds of the unprofitable lines, to leave the remaining system to pay its way. 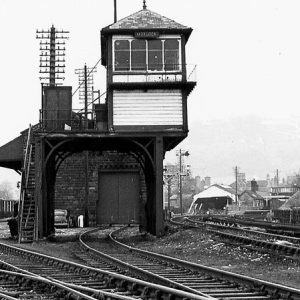 The first implementation of the report’s proposals was to be the closure of both Buxton branches to passengers. The protests of the local inhabitants deferred these closures. The closure of the Ambergate-Chinley section began in 1954 when Dove Holes tunnel was found to be unsafe. The line was closed at night in order to carry out repairs and trains never again ran at night over this section. 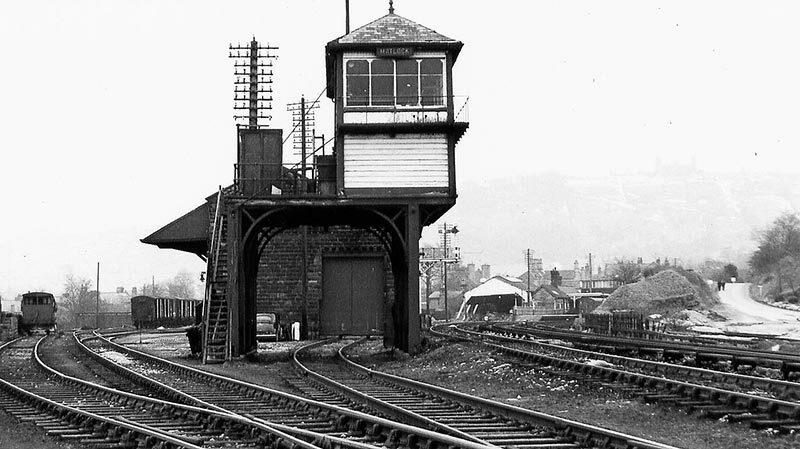 Freight traffic was diverted via Chesterfield before local passenger services ceased in March 1967, with the closure of the following stations: Millers Dale, Bakewell, Rowsley, Darley Dale and Matlock Bath. However, through trains from St. Pancras to Manchester continued for another year. Since that time trains still run as far as Matlock and freight trains travel along Ashwood Dale from quarries in the Peak Forest area. When in 1968 the last of the direct St. Pancras-Manchester express service was transferred away from the Peak Line and the track quickly lifted, it seemed like the days of rail access to the Peak District had gone forever. Rail enthusiasts on their own initiative got together to form the “Peak Railway Society”. After an initial meeting, membership quickly grew to over a thousand people and then later a commercial operating company “Peak Rail Operations” was formed with the aim of restoring the Peak Line for recreational and community use. The long uphill struggle then began to convince local authorities of the viability of restoring and maintaining a 20-mile railway. Shops were opened at Buxton and Matlock and members attended many fund-raising and publicity events to inform the public of the society’s aims. 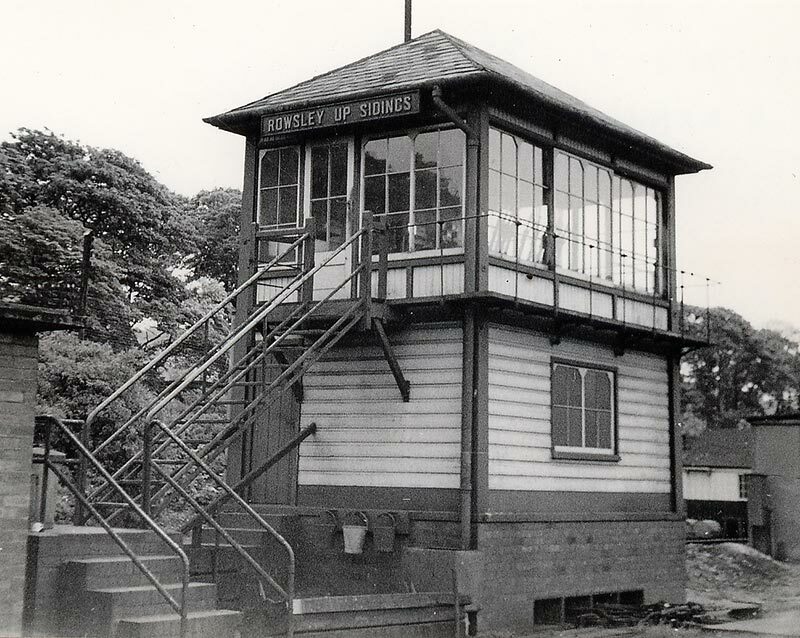 In 1981 the former Buxton Midland site was purchased and turned from what was derelict ground into a thriving Steam Centre. In 1986 P.R.S. and P.R.O. merged to form Peak Rail Limited to provide a more co-ordinated approach with a tighter management structure. Eventually in 1987 a special local authorities joint working party agreed to recommend to their respective constituent authorities’ acceptance of Peak Rails “Fifteen year Financial and Operating Plan”. This comprehensive document detailed the phased plan for reconstruction and operation of the railway identifying sources of finance, method reconstruction, analysis of potential business markets and the pattern of services, with due regard to environmental protection. October 1988 saw the successful launch of the first major share issue converting P.R.L. into “Peak Rail plc”. The proceeds of this issue were used to fund the rebuilding of the railway from Darley Dale to Matlock (Riverside) which opened to public services in 1992. Insufficient finance delayed further construction to the Buxton Steam Centre was closed, and parts of the land sold, which allowed building to continue northwards. 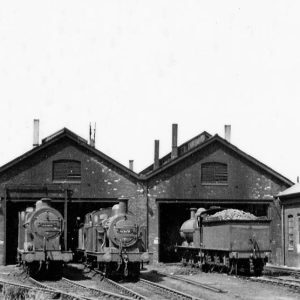 A second share issue provided the funding required to reach Rowsley (South) in 1997 and allowed the redevelopment of the former Rowsley engine shed site. Following some years of consolidation Peak Rail has prospered and completed its southern objectives in 2011, when the major redevelopment of the former Cawdor Quarry in Matlock allowed the railway to extend its services into Matlock Station giving Peak Rail a town centre terminus and a cross platform link with the national rail service. However, the ambition to complete the re-opening of the railway through the Peak District National Park to Buxton remains alive. Consequently, Peak Rail is currently in discussions with various commercial interests, together with the relevant national and local authorities, about the possibilities of re-opening the railway as a freight diversionary route which would allow Peak Rail to extend its services northwards. The lines rich railway history, together with the prospect of again being able to travel through magnificent scenery on a railway linking some of Derbyshire’s principal tourist centres, ensures that the desire to fully re-open the railway will never diminish.